During my early years in Catholic Grammar School I was the only white kid to be seen. As a child from 5 to 13 years old one doesn’t spend much time considering race. At least I didn’t as a white person. I never really felt much different, never felt left out and I’m still in contact with many of the other students. All and all it was great experience and I didn’t realize until later in life how much that experience helped me when considering the plight that people of color experience on a daily basis. I consider myself to be very lucky to have the upbringing I have had. It has helped with seeing other people’s point of view on a level I truly believe many can’t. What I honestly gained was an empathy for what any person of color has to go through in life. I’ve generally had it reasonably easy in life. The hardest thing I do these days is Pilates. From getting less traffic tickets to not being followed around stores when I actually was stealing. There is a never ending litany of things I’ve gotten away with because I’m a white man in America. To deny this truth from any point of view would be imprudent. In addition to deny the talent held within Rebirth of Rabbit’s Foot would be vacuous. On November 19th at 8pm at the Pit at 123 East 24th Street I saw a show that exemplifies the direction theatre is going and the major changes happening everyday before our eyes in our own country and around the world. 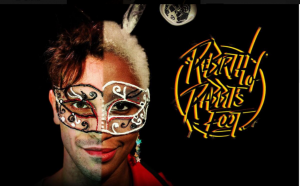 The story of Rebirth of Rabbit’s Foot is essentially based around an open mic run by a group of people of color. A group of white people muscle in on their show and try to change it. The story is about the fight between selling out and not selling out and what one goes through when considering that notion. What it truly points out is how much harder people of color have to work to get what they have and how often they are taken advantage of. This concept was shown very clearly in Rebirth Of Rabbit’s Foot , which in essence is a forcefully clever take on race relations, the entertainment business and human interaction and all concepts held within. I have never truly understood how anyone could say any entire group of people was better than another. I think that comes from being the only white kid in school. What stands out most to me during this production was the music and lyrics. All written by Austin Antoine who acted as special guest for this very special presentation. Antoines piece in particular stood out. He told a great story/rap/eargasm about a rejection he experienced. It was effectively touching and real. The piece brought some of the audience to tears and some serious feels. One could easily see Austin blow up on the scene soon. Also standing out were creator of Rebirth of Rabbits Foot, Jordon Waters, who this night played, the mute, Ted, in his whirling dervish of actors that constantly changes. Jordon played the part to perfection. The most impressive thing a performer can do for me is convey feelings and experience without words for an entire 90 minute production. Jordan did this with ease all the time showing his ability to move with fluidity and consistent comic timing. His ability as a performer truly stood out. 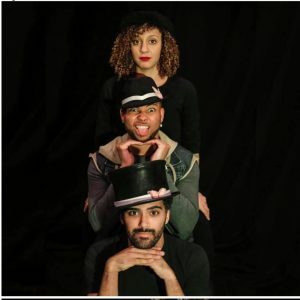 Also standing out and constantly adding moments of truly funny were Coffe aka Chocolate Bunny, Stephanie Marrow and Cream aka Snow Bunny, Christopher Trindade. Every moment they were on stage added to an already solid production. One of the songs that sticks out most oddly enough, or maybe not so oddly was a one called “Repeat ” which Briawna Jackson and Austin Bowen wrote and rapped to perfection. A piece about how everything repeats over and over while repeating the phrase over an over. A fun catchy beat. A great metaphor for how we make the same mistakes over an over again. 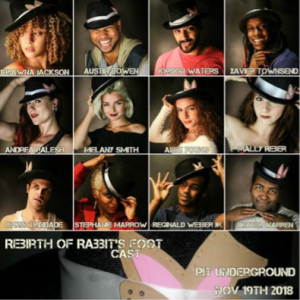 You have the chance of not making the mistake of not seeing Rebirth of Rabbit’s Foot which will be showing Dec 17th at 8 pm at The Pit on 24th St and in March the production finds it’s way abroad in Amsterdam, Holland. See it, you will not regret it. Benny – Reginald Webber Jr.
if you haven’t seen this show yet, this is time to see the show! We have some great laughs for you and awesome performers. Jordon Waters, Xavier Townsend, Melany Smith Andrea Elizabeth Palesh, Briawna Jackson, Austin Bowen, Mally Reber, DexStar Warren, Reginald Webber Jr., Stephanie Antoinette Marrow, Chris Trindade and Alex Young. +Special Guest Austin Antoine Visiting us again from Los Angeles. + Only $10!! Also going to Amsterdam in 2019! Help us raise money by coming to the show and sharing and or bringing people who love a great time!!! This is the Trailer if you want to see what your in for!